The good news is, even if you don’t have superpowers and even if you’re not so great with katana, you can still look like the Merc with a Mouth! You just need this officially licensed costume from Marvel. 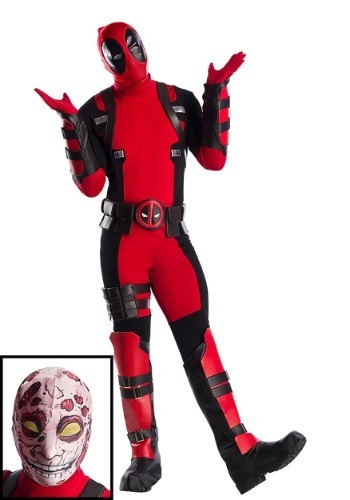 This plus size Deadpool costume is a premium outfit based on the iconic mutant from the X-Force and X-Men comic books. It comes with a bright red jumpsuit that has black accents along the sides and legs. It also has a belt with the Deadpool symbol on it. It also comes with boot tops that can be worn with any pair of boots to help give you a mercenary look from head to toe. It also comes with a classic red and black mask, but that’s not even the coup de grace of this costume. A second mask, which has Wade’s scarred face printed on the exterior, is also included to really make you feel like the Marvel hero. When you’re all dressed up in this Deadpool costume, you’re going to feel just like the Merc with a Mouth. Just make sure that you pick up a few sword weapons and a few toy guns to get a realistic look this year!